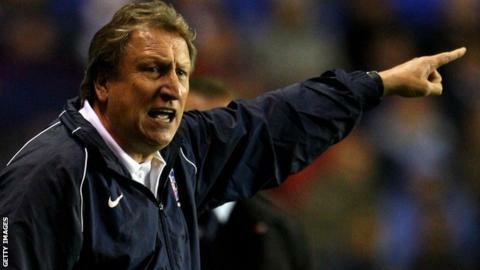 Crystal Palace have appointed former boss Neil Warnock as their new manager. The 65-year-old, who was at Palace between 2007 and 2010, has signed a two-year deal after being chosen ahead of ex-West Brom boss Steve Clarke. Palace chairman and co-owner Steve Parish has turned to Warnock as a successor to Tony Pulis after Malky Mackay was ruled out last week. "He is the right appointment. He did a great job when he was here before and he understands the club," said Parish. The London club are keen for caretaker manager Keith Millen to be integrated into the new set-up. Warnock has been told he will have funds to spend before the transfer window closes on Monday. Both he and Clarke were interviewed this week after Palace turned their back on Mackay, and Tim Sherwood pulled out of the running. Pulis left on 14 August, just 48 hours before the new Premier League season. Warnock has been out of work since parting company with Leeds in April 2013, although in March he turned down the opportunity to manage Nottingham Forest. His return to Selhurst Park will reunite him with winger Jason Puncheon, who was fined £15,000 by the Football Association for comments on Twitter after taking exception to criticism from Warnock about a penalty miss against Tottenham. Warnock's previous stint as Palace manager ended as the Eagles went into administration and suffered a subsequent 10-point deduction. The club dropped from Championship play-off contenders to a battle against relegation, which they narrowly avoided. Parish told BBC Radio 5 live that he expected Warnock to be a success, adding: "We saw a number of people and decided Neil was the best person to come and help the club. I could maybe have got a manager from abroad, many exciting names applied for the job. "Neil's got five days to go and bring in players that will improve us as a football club." Former Stoke City boss Pulis won the Premier League's manager of the year award last season after guiding Palace from bottom of the table, the position they occupied when he took over from Ian Holloway in November 2013, to an 11th-placed finish. But he became frustrated by the failure to land a number of summer transfer targets and left the club by mutual consent only 48 hours before the start of the new season. Mackay had been the favourite for the job until allegations emerged of misconduct during his time at Cardiff. He has admitted sending offensive text messages, allegedly shared with Iain Moody, who worked as head of recruitment at Cardiff before being sacked in October and quit his role as Palace's sporting director last week after the claims emerged. Under Millen, Palace have lost their opening two league matches, 2-1 at Arsenal and 3-1 at home to West Ham, but secured a 3-0 away win over Walsall in the Capital One Cup second round on Tuesday night. In an unusual move, Warnock's appointment was confirmed first on the club sponsor's Twitter feed, prompting Palace communications officer Luke Tugby to tweet: "Before criticism comes the way of #cpfc comms team, the decision to have Neteller release before the club's own website is out of our hands." 1993: Guides Huddersfield to Autoglass Trophy final at Wembley in his first season January 2012: Leaves Loftus Road with QPR sitting 17th in the Premier League. Circus at the Palace: Where did it go wrong? Read more on Circus at Crystal Palace: Where did it go wrong?